Habaki : Gold foiled double Habaki. Blade length :　49.3　cm or 19.40 inches. 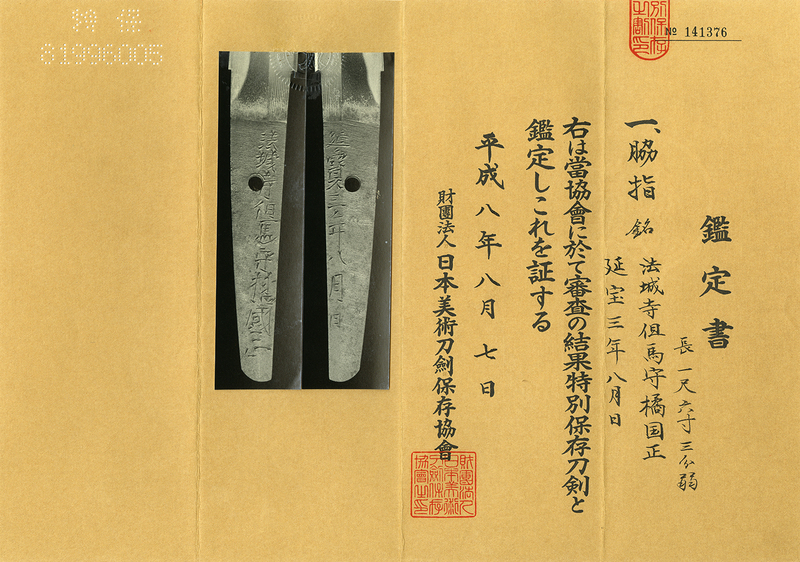 Width at the Kissaki : 2.26 cm or 0.88 inches. Kasane : 0.68 cm or 0.26 inches. Era : Edo period. Enpo era. 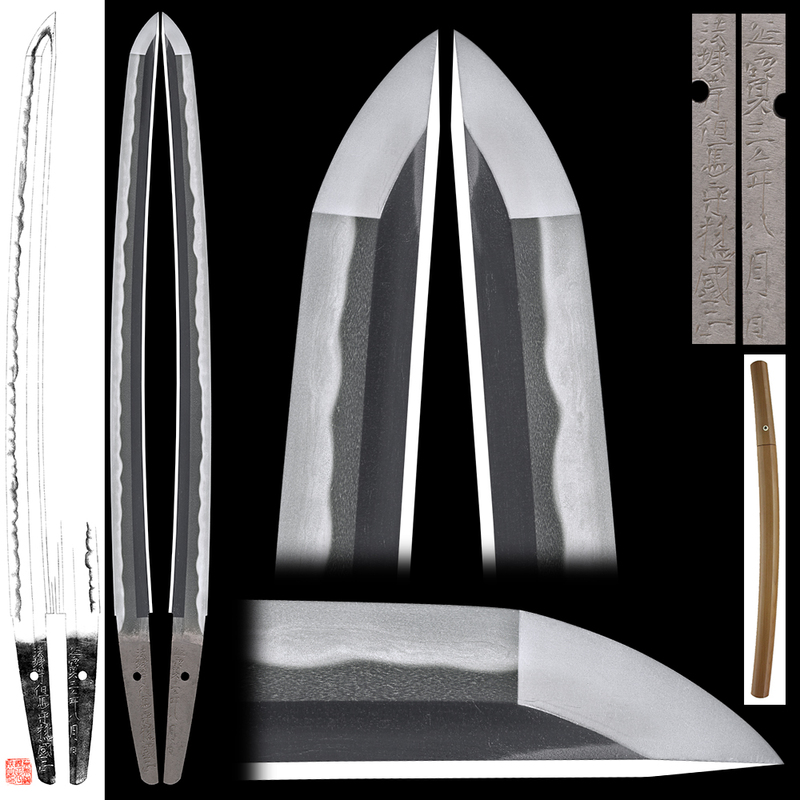 Shape : Wide and thick blade. The Kissaki is long. This is typical Hojoji school strong Jigane. The Ashi is wide. Boshi is pinched and round shape with thick Nioikuchi. Special feature: Hojoji Tajima Kami Tachibana Kunimasa is a sword smith in Musashi province. He is Edo Hojoji school. He worked with Kazusa kami Kaneshige, Izumi kami Kaneshige, Sadakuni, Masahiro, Yoshitsugu etc. This blade looks like Kotetsu. The Nioikuchi is thick, the Ashi is wide. This blade is nice. 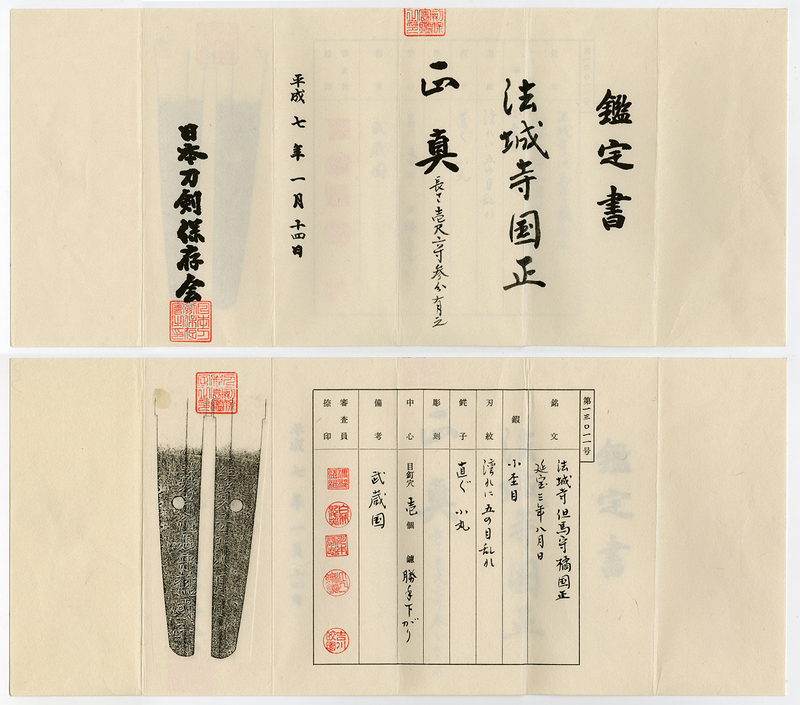 There is date”Enpo 3 nen 8 gatsu hi (August 1675)” on the Nakago which is rare. Tsuba: Round shape iron Tsuba, Aoi Mon family crest is engraved with open work. Fuchikashira: Shakudo Nanako, chysanthemum is engraved with gold color.